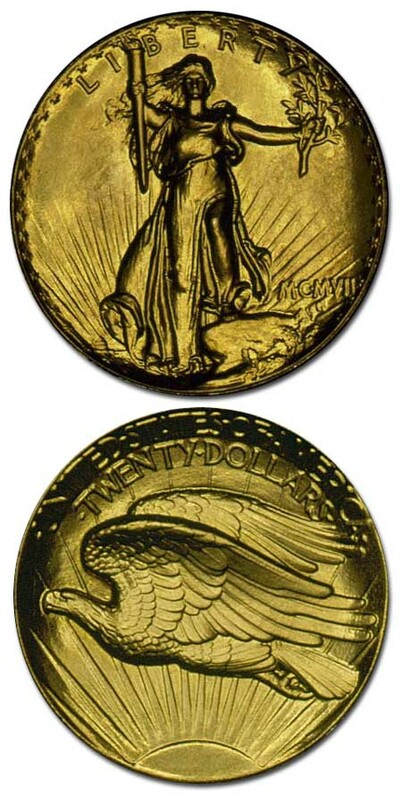 MCMVII (1907) Saint Gaudens Roman Numerals Double Eagle. Extremely high relief, sometimes called “Ultra High Relief.” Proof. One of the most famous, beautiful and desirable of all American coin rarities. Born out of the cooperation of President Theodore Roosevelt and noted sculptor Augustus Saint Gaudens in their quest for a more “classical” American coinage, the coin’s exceptionally high relief ultimately doomed its intended use as practical circulating coinage. Approximately 24 pieces were struck of which it’s estimated that just 19-22 examples exist today.